C & I went to a wedding this past weekend in Colorado; as soon as the plane tickets were purchased, I was on the phone to Frasca, making a reservation for Friday night. 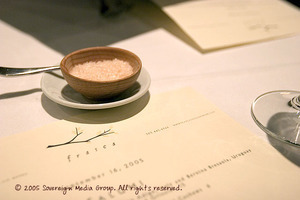 You see, I'd been to Frasca once before, and knew that I had to introduce C to the magic of their kitchen. And, well, yes... I had to be sure that it was everything I remembered. And so it happened that we arrived at Frasca on Friday night at 8:45 (having changed our clothes in the car after our mad dash from the airport due to a delayed flight) to enjoy one of the finest meals we've had all year. A couple of glasses of Bisol Prosecco ($12) while we perused the menu hit the spot. 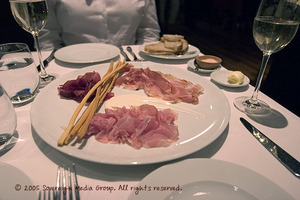 We knew we had to order Salumi ($15), a gorgeous assortment of Prosciutto San Daniele (Friuli), Speck (Alto Adige) and Bresaola (Uruguay) served with slender, crispy breadsticks and a faintly sweet horseradish cream. Our only service snafu of the night was the forgotten House-Cured Pickles & Onions ($4), but the salumi were so delicious we didn't even miss them. At this point, we asked our waiter to please arrange for wine pairings with our remaining dishes. With our Anson Mills Polenta with Butter Roasted Lobster Mushrooms & Montasio Cream ($12) we were served glasses of Marco Felluga "Molamatta*" ($12). The polenta was wondrous... creamy but still light, with a rich, earthy flavor from the mushrooms. Finished with a drizzle of olive oil, this is exactly what polenta should be. The Molamatta (a blend of Tokai Friuliano, Pinot Bianco & Ribolla) was quite acidic, with a nose of green apple and honey. Not usually one for racy whites, I really enjoyed this wine with the polenta. C, departing from his usual routine (he was sick, after all), ordered Risotto with Heirloom Tomatoes, Housemade Ricotta & Tomato Juice Vinaigrette ($16). Wow. 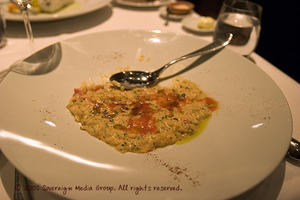 How they extracted the very essence of the tomatoes so purely, without losing the character of the rice is beyond me. It was so delicious that he forgot to take a photo before getting a third of the way through his plate. 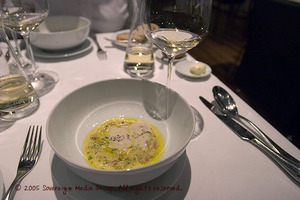 With the risotto, he was served a glass of Movia Ribolla ($16) from Brda, Slovenia (right across the border from Friuli). This is his new favorite white. Echoing everything that's pleasant about a lightly-oaked chardonnay, but with a creamy, spicy kick, this wine was a beautiful match for his risotto. 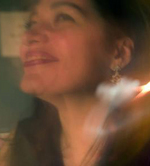 As long as C was going to stray from the norm, so was I, dammit! And so, with much irony (flying inland for FISH? 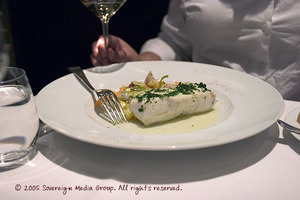 ), I ordered Pan Roasted Atlantic Halibut with Boulder County Farms Succotash & Olive Profumato ($28). The fish was meltingly tender but still "meaty" while the succotash was sweet and savory all at once. Really lovely. My wine pairing with the halibut was La Roncaia "Eclisse" ($13). It was not my favorite wine of the evening, though it paired nicely with the fish -- I just thought it was rather too simple compared to the other wines we had, and wasn't very exciting. 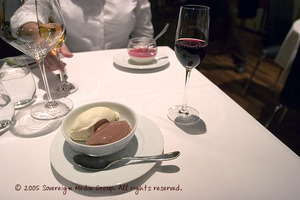 Dessert was a challenge... there were so many fabulous-sounding choices, from Artisanal Cheeses with Sumac-Marinated Table Grapes ($11) to the Peanut Butter Cup (Whipped Dark Chocolate Gelato and Warm Peanut Butter Mousse - $8). In the end, though, I chose the Vanilla Bean Panna Cotta with Raspberry Jam ($8), and C stayed very much the purist with two scoops of gelato -- Tahitian Vanilla Bean and Valrhona Chocolate ($2 each). Both were perfectly executed, and delicious. The suggested pairing for my panna cotta was a moscato, but I just wasn't feeling it, so I went with the Inama Apres Vulcaia ($12), a late-harvest Sauvingon Blanc. This was a fat, mouth-coating, botrytised wine, loaded with apricot and orange peel notes. While it might not have been the best pairing, I'm thrilled that I went this direction because I've discovered a wine to stock my cellar with. C's Felsina Vin Santo ($12) was exquisite -- honey, spice... you know the rest. It gave off the faintest scent of petrol, but in quite a nice way. Afterwards, Bobby Stuckey sent over a couple of glasses of Amaro Averna, a Fernet Branca-type digestivo (though, much more palatable to me that F-B), while we chatted about A16 (they are "cousin" restaurants), San Francisco and Friuli. When we apologized for our shabby appearances, he said, "I love anyone who changes in their car to eat here!". Listening to him mentor and guide new staff, and make the rounds through the restaurant, stopping at each table with a kind word or interesting question is fully eye-opening. Bobby is a master at his art, much as Lachlan Mackinnon-Patterson is of his. I adore Frasca. I really do. I think it's so wonderful that they are booked up over a month in advance, and clearly take care of their people (in fact, Bobby & Lachlan took 20 of their staff to Friuli this past year for a few days of "Immersion"). Not only do they support local farmers with a seasonal menu, they are also an active Slow Food member.